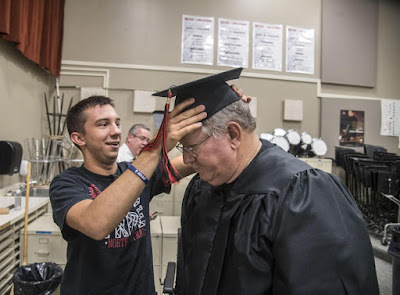 In a back room of North Central High School on Wednesday, Steve Fisk gently draped a graduation gown over the hunched shoulders of 68-year-old Vietnam veteran Stephen Rieckers. Then Rieckers rolled his electric wheelchair onto the stage of North Central’s auditorium to receive the diploma he never got. “To me it’s a valuable thing, because it’s something I’ve been after for a long time,” he said. Rieckers should have graduated in 1969. Instead, he dropped out of high school at the end of his junior year to escape an abusive step-father. He then enlisted in the military and served two tours in Vietnam as a helicopter mechanic.